Some of the earliest forms of consumer credit were installment loans. These loans were commonplace in the United States since around 1850 with sewing machine financing and really began to catch on. Women were the most enthusiastic about the advent of sewing machines on easy credit. Before the sewing machine it took on average fourteen hours to make a shirt and with a sewing machine, just one hour. It was a huge labor saving device and by 1890 the price of the machine had dropped to about $30 or $40 if you financed it. The financing plan offered by Singer was simple, ” dollar down, dollar a week”. In 1882 a German-American housewife wrote to the New Yorker Volks-Zeitung newspaper and said “I buy everything on credit until I get no more, then I go to another store and do the same there.” Consumers loved credit. Furniture dealers also quickly embraced installment sales. 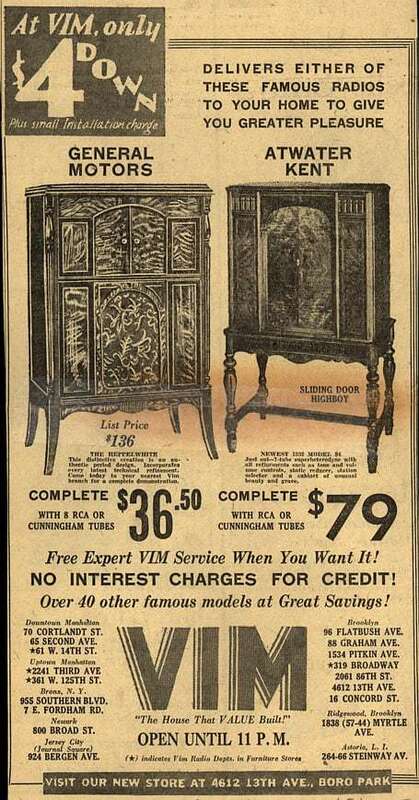 An 1899 study In Boston found that half of the city’s furniture dealers were already selling on installments. Around 1900, with the advent of automobile financing, installment sales exploded and just seven years latter, installment transactions were much more common for other items and were used to commonly finance sewing machines, radios, electric refrigerators, phonographs, washing machines, vacuum cleaners, jewelry and clothing. Henry Ford was producing record numbers of Model T cars and trucks but financing from Ford was not available. In 1916 the car cost the average wage earner almost half a year’s income. Auto financing developed because the first wave of car purchasers were beginning to sell their used vehicles and buyers needed help to purchase them. New car buyers also needed assistance to aquire their vehicles so third-party finance companies appeared to borrow funds from banks and finance car purchases. By 1924, 75% of automobiles were purchased with installment loans. 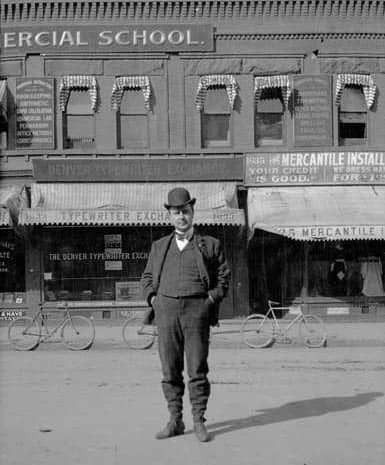 1900 street scene in Denver, Colorado. Note credit advertisement in background. Approximately 80% of phonographs were sold using installment debt, 75% of washing machines, 65% of vacuum cleaners and 25% of all jewelry sales. It is amazing to read about the early warnings of installment debt from merchants. Even though the warnings were issued, Americans had already had a taste of the “good life” and it was impossible to stop the growth. One fact which has passed many by, it is simply not true that the invention of consumer credit was the invention of the indebted American. A river of red ink runs through American history. What is an Installment Plan? Instalment buying is an old practice. Writers on the subject have cited numerous instances from history to show how old the practice really is. It is said that Crassus, the contemporary of Julius Caesar, made a large part of his enormous fortune by building houses outside the walls of Rome and selling them on the instalment plan. A recent writer mentions an instalment transaction, similar to those of the present time, which took place a century ago. The Countess of Blessington at one time found herself in the disconcerting circumstances of greatly desiring a suite of furniture which she was unable to purchase because she lacked the necessary funds. Her desire for this suite of furniture was too great, however, to be thwarted by insufficient funds, and so she contrived a plan of partial payments and persuaded the cabinet-maker to accept, in lieu of cash, a down-deposit representing a fraction of the cash price, a lien on the furniture, and a promise of further payments to be made at regular intervals until her debt should be entirely liquidated. The practice of the present time, in principle, is not greatly different from what it is said to have been in this particular case of one hundred years ago. An idea as to the length of time selling on the instalment plan has been practiced in this country, as well as the character of the goods thus sold, may be gained from the fact that building and loan associations, which provide for the buying of houses on this plan, have been in existence for more than seventy-five years. The Singer Sewing Machine Company has been doing a very profitable business in this manner for more than fifty years. There are also numerous piano and other musical instrument houses that have been selling this way for the same length of time. McCormick reapers and binders have been sold in this manner almost from the beginning of their use. Equipment purchases of railroads have been made on the partial payment plan for many years. The Encyclopaedia Britannica has been sold on instalments for many years. In 1898, this company launched a campaign in England which was remarkably successful for selling the work for one guinea cash and thirteen monthly payments of one guinea each. Advertising and High Pressure Salesmanship.–Modern methods of advertising and high pressure salesmanship are without doubt partly responsible for the extension of instalment selling among the poorer classes. The following statement, by one whose knowledge of the incomes, expenditures, and needs of the poorer classes is such as to make his words carry weight, is worth repeating in connection with his point, although it was not made in connection with instalment selling: “Did you ever think of the strain to which people with small incomes are subjected by our continual pursuit of them to spend their money? Every newspaper, every magazine, every street, every railroad track, every street car, every country road is lined with advertisements carrying suggestions intended to be subtle, though often they are blatant, to buy, buy, buy. Every human impulse, good and bad, is played upon. Not only do we advertise publicly, but we send letters and agents to the homes to try to extract from any and every one what money he has. In every way we set about deliberately to make a person feel that life will be a failure unless he or she uses this soap or shaving cream, drives this automobile, owns this radio, sees this movie or play, eats this food, wears this collar, takes this trip or reads this newspaper. This continual pressure relentlessly applied subjects our working-class population to a strain which they cannot withstand, nor could we in their places.” Many of these people cannot resist the temptation to buy under these conditions, and consequently become easy prey for the high pressure salesman with his E.Z. TERMS. Poor and Irresponsible People. — Previous to the recent expansion of the instalment system, buying on the instalment plan, except houses and insurance, was practiced almost entirely by poor people. Not only were the people poor, but sometimes they were the least responsible individuals of the community. Under these conditions, losses to the dealer were great, and consequently the price charged for the credit so high that only those people bought on these terms who could not possibly make any other arrangements. Up until about ten years ago, there was strong social disapproval of the practice–it was looked down upon, and there is still a certain social stigma attached to buying clothing on time. It is only within the last five years that instalment buying has become a respectable thing to do. Poor, Middle Class, Well-to-do, and Very Rich People. — At the present time, instalment buying is not by any means confined to the poorer classes. Indeed, all economic groups, except very rich people who do not bother with the system, are using it on an extensive scale. However, it is the judgment of those connected with the business that the proportion of the various groups using it is much larger for the lower income groups. From conversations which we have had with numerous consumers as well as with retailers engaged in the instalment business, we believe that there is a marked tendency for lower salaried and even well-to-do people with comparatively large incomes, but who anticipate larger incomes, to buy on deferred payments. A study was made recently to ascertain the approximate proportion of heads of families using instalment credit in a city of 60,000 people, Five hundred and thirty-two families were canvassed, living in forty-one residence square blocks and constituting a sample of the classes of the entire population. Of these families, ninety-three, or seventeen and five-tenths per cent, made use of instalment credit for purchases of varying amounts, exclusive of insurance and real estate, which ranged from twelve dollars to fourteen hundred and twenty-five dollars. It was found that forty per cent of the families canvassed in the poorer part of town bought on the instalment basis; twenty-five per cent of those canvassed in the middle class sections of town bought in this manner; and five per cent of the well-to-do families used the system. This special study confirms the general belief that all classes are buying on instalments, but that the percentage of the various classes using the plan is greater for the lower economic groups. The extensive use of the system by other than the poorer classes is evidenced by the fact that instalment selling of furniture is practiced by stores dealing with a high class clientele; also that whereas formerly only cheaper jewelry was sold on instalments now expensive articles are sold in this manner and the number of high-grade jewelers selling on deferred payments is steadily increasing. Only three or four years ago, the higher priced cars were sold on time-payments very quietly, but now it is reported that “as many of the expensive products of the General Motors Corporation as of their cheap cars are sold in this way.”30 In addition to expensive automobiles, this company sells electric refrigerators, the prices of which are such as to indicate that they are not bought, for the larger part, by poor families. It is stated that the high pressure salesman, with his E.Z. TERMS, causes people to buy and consume things which they could not possess, if they were required to pay cash. Emphasis is place upon the point that by working on the natural inclination of individuals to possess luxurious articles, the salesman frequently causes the customer to purchase indiscriminately articles of luxury which are quickly consumed. The reasoning is that the instalment buyer soon acquires the luxury habit by being able to possess these articles, and that the luxury habit, thus acquired, leads to spending and consuming rather than to saving. Those who think that instalment buying is not conductive to saving mention frequently the demoralizing effect of too much debt on the individual. A Western banker expresses the ideas of many people when he says, “Wage-earners are mortgaging future earnings for the gratification of present-day pleasures without thought of the morrow that may bring with it sickness or unemployment. Everywhere in the United States instalment-buying is leading our people into a morass of debt that will engulf them unless the dangers of system are brought before them so forcibly that they will resist the temptation.” The condition here described, if it exists, is certainly not conducive to saving. Instalment Buying Is Creating a Generation of Spendthrifts — It is the view of some people that “this system of allowing individuals to buy more than they can pay for” is creating a generation of improvident people–spendthrifts. It is causing individuals to form habits of extravagant spending, rather than the socially desirable habit of saving. The practice of thrift has been a copybook maxim for generations and our parents brought us up to believe that saving is a virtue. There was a time when being in almost any kind of debt was considered somewhat of a family disgrace. Moreover, buying on the instalment plan was considered one of the lowest forms of debt that one could contract–it was looked down upon socially. It was considered an arrangement for persons who were poor, improvident–not able to take care of their own affairs. They needed a collector to tell them under threats how to dispose of their money on pay day. Now what has happened? Respectable people, without any feeling of shame, ride around in motor cars, even expensive one, which are not paid for. When one’s neighbor drives out in a new car, the odds are exactly three to one that he is borrowing from the future, living beyond his means. Respectable people are wearing expensive furs and jewelry, bought on time. Instalment buying has acquired an air of respectability; the automobile is said to be responsible for our looking at this old practice in a new light. It is the opinion of some people that the conditions here described are having a deteriorating effect upon the character of individuals. And what is more important, children are being reared in this environment, and they, not having had lessons of thrift instilled into them, will be economically less responsible than their instalment-buying parents. Demetrios, son of Alkimos, to Zoilos, son of Ouetis, greeting. I have received from you, as an instalment on what you owe me, one hundred silver drachmai, without any loss to me with respect to the remainder, in accordance with the written agreement which I have from you. The seventh year of the Emperor Caesar Trajan Hadrian Augustus, Epeiph 24. (2nd hand) And on the first day of the month Thoth of the 8th year of Hadrian Caesar the lord, through Neilos, another hundred silver drachmai, without any loss to me with respect to the remaining hundred drachmai, and a half-kados of radish oil. I shall receive the remainder in the current month. If I do not receive it, I shall get interest on the remainder from the month Phaophi. The 8th year of the Emperor Caesar Trajan Hadrian Augustus, Thoth 2..
thanks for your post! I learn a lot from you about the history of credit and debt. People until now really loves credit but the consequence of having credit is far from it’s benefits.